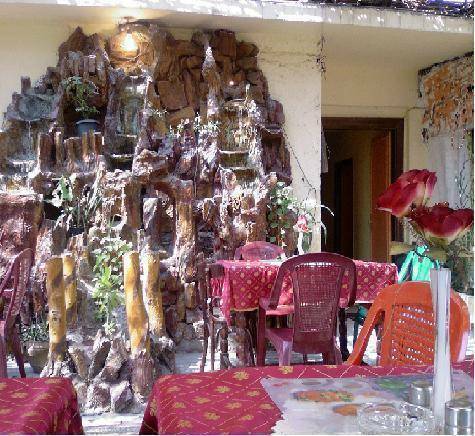 The open air roof garden is only one of the attractive features of this budget hotel. It's a legend among budget travelers and is still one of the cheapest places available in Cairo. The nice roof garden is divided into different parts. 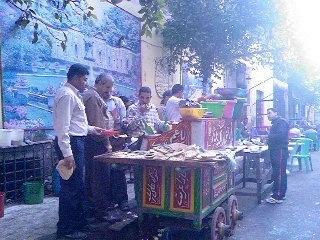 Every part is resembling different culture of Egyptian life. The restaurant which is open 24 hours, has an oriental sitting area, a water fountain and a billiard table free for the guests. The roof top restaurant serving a variety of Egyptian dishes and shisha (waterpipe), also there is satellite T. V. available. This roof terrace has a peaceful and friendly atmosphere a place to meet fellow travelers. 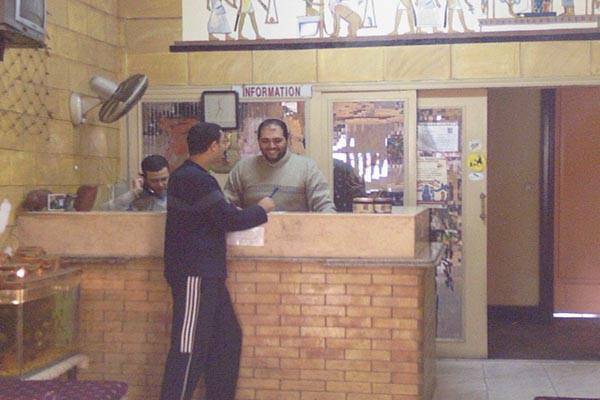 The friendly staff, which speaks several languages is always available to answer any questions and to give advice on things to do and see in Egypt. There aim is to make your stay at the New Palace as comfortable and Enjoyable as possible and making new friends, as well as keeping the friendship with the frequenters. Book a minimum of 3 nights in one of our ensuite rooms and you will receive a free transfer from the airport to the hotel upon arrival. Book a minimum of 5 nights in an ensuite room and you will receive a free day trip to the Pyramids. Book a minimum of 7 nights in one of our ensuite rooms and you will receive one hour horse riding at the desert for free. 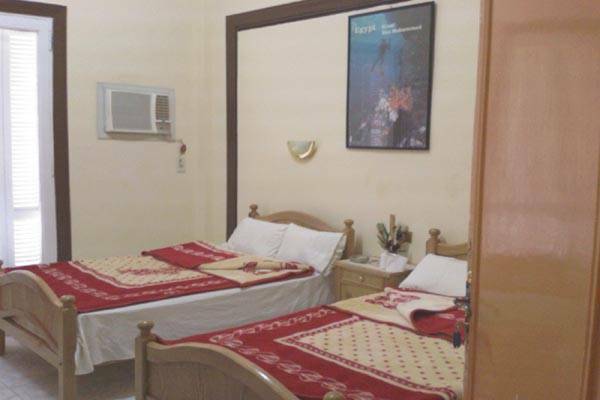 Rooms with private bath and air condition varries between single, double and trilples. Rooms with a sharing bath also varries between single, double and triples. Dormitory which is either male or female some with a sharing bath others with private. 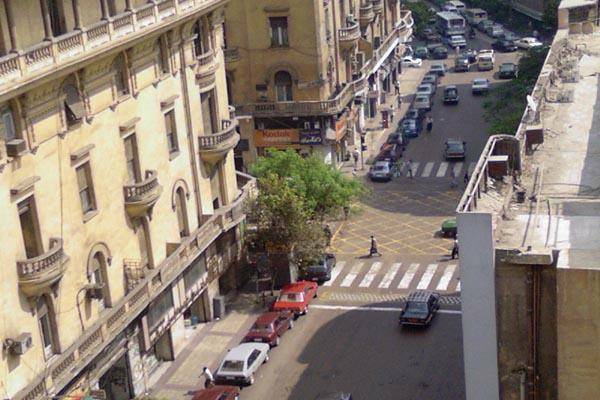 Soliman el halabi street is between Orabi street and emad el din street where there are a lot of restaurant and movie theaters, the hotel is in the same street of cosmos movie theater and close to eltabee restaurant from the other side of the street. a) To reach us from the airport, you take a taxi for 65 EP or we can pick you up by our shuttle for the same price round the clock. b) From Ramses Station you have just to take a taxi for 5 Egyptian pound or you can walk down along Emad El Din St., to Cosmos Movie theater. c) From Tahirsquare (Egyptian Museum) you can take a taxi for 7 Egyptian Pound or you can walk all the way down from Talat Harb St., to Orabi St., where you will find the hotel. We offer versatile and tailor made tours (at your discretion), transport and collection from airport, trains and bus stations which are highly recommended by a lot of travelers who accepted it. We also sell international and local flight tickets as well as train and bus tickets. We are pleased to help our clients to issue an international student card. The hotel can provide the clients with map of Cairo and brochures for the different cities of Egypt.